The invitation is open for children ages 6 through 12 from all over Mexico to send in their drawings and participate in this free contest, which seeks to raise awareness about the plight of the sea turtles. The deadline is June 12, 2015. 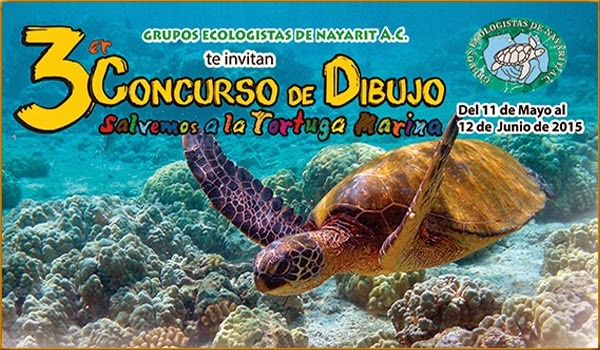 The Grupo Ecologista de Nayarit has extended an invitation to its 3rd Save the Sea Turtles Drawing Contest based in the Riviera Nayarit, which seeks to raise awareness among children about this endangered species and the need to preserve it. The Riviera Nayarit Convention and Visitors Bureau’s Groups and Events department is actively hosting this event because of its importance in creating a collective consciousness among the younger generations, something that is key for the destination and its natural environment. The invitation is open and completely free for every child in Mexico between 6 and 12 years of age. The group will be divided in two categories (6-9 and 10-12) and they will be tasked with drawing their own images alluding to the importance of conserving this species, which likes to nest on the coasts of Nayarit. The drawings have to be on letter-sized paper, freehand, without any stickers, and must have the participants’ information on the back (name, telephone number, age, email, city, grade and school). The deadline is June 12th; the semifinals are on June 20th and the grand finale will take place on June 27th on the grounds of the El Naranjo Turtle Camp. First-place prizes awarded, but everyone who participates is a winner. For more details on the invitation, the rules and results please visit www.campamentoelnaranjo.org.mx. For questions and comments please contact ricardovallarta@prodigy.org.mx.